The only “complete” Marvel comic book story (if such a thing exists) that I have read to this day is Civil War, a seven-part 2006/07 series that was given to me as a gift a couple of years ago. A positively gigantic event, the series divided literally hundreds of Marvel characters down an explosive ideological line – one side led by Tony Stark/Iron Man, in favour of regulating superhero activity to safeguard against massive collateral damage – the other by Steve Rogers/Captain America, unable to reconcile his desire to do good with the politics he feels would impede true justice. When Kevin Feige announced that Marvel Studios would be doing an adaptation of sorts a couple of years ago, I was skeptical of the project, and I wasn’t alone. How could they possibly do justice to the expansive, universe-shattering story with so few established characters in their stable? As it turns out, the film version of Civil War, appropriately prefixed as Captain America: Civil War, is such a loose adaptation of that comic that the argument is moot. Sure, there are nods to the structure of the original, but what the movie actually turns out to be is primarily a story about Captain America (the still-amazing Chris Evans) and the closest relationships in his life, and on that front, it succeeds spectacularly. It also has some pretty cool supporting characters, and almost all of them add to the sheer fun of the spectacle. Though Captain America: The Winter Soldier was a more focused film, returning directors Joe and Anthony Russo have now proved that they can handle much bigger casts with aplomb, resulting in a sequel that is almost as good as its predecessor, and noticeably fresher than Avengers: Age of Ultron. Time to make good use of an extremely rare case where Australia gets a huge movie before the US does. I’m still questioning why the first Amazing Spider-Man had to play out the way it did in 2012. Sure, I get the business reasons behind Sony Pictures wanting to keep the Spider-Man license and thus needing to churn out another film within a certain number of years after the conclusion of the Sam Raimi trilogy of Spidey flicks. But I’m sure I don’t stand alone in the camp of people wondering why said situation had to mean a reboot functioning almost identically to the first 2002 Spider-Man. 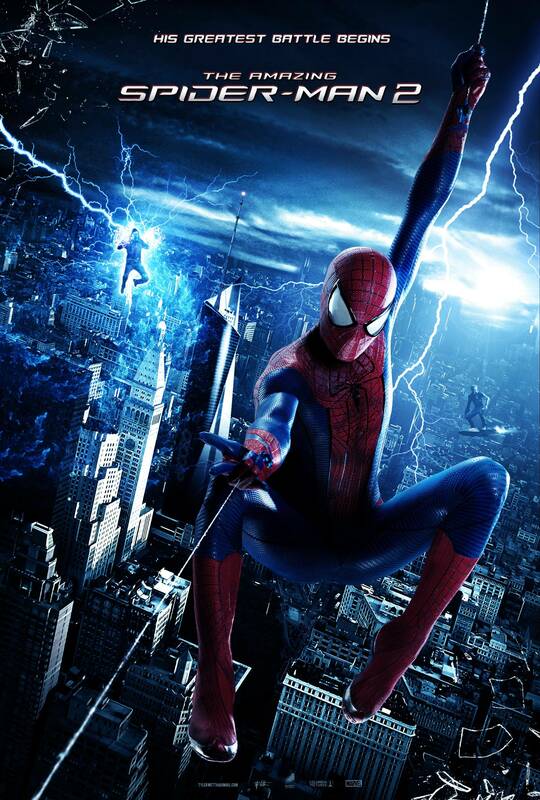 The Amazing Spider-Man 2 presents an opportunity for the aptly named Marc Webb and his gang to kick on, having established their groundwork, and show what sets this new version of Spider-Man apart from the mostly well-regarded Raimi movies. In this regard, ASM2 succeeds, which is great, but disappointingly it fails to learn from the mistakes that plagued Raimi‘s Spider-Man 3 – the one that had too many villains vying for attention. It’s just a wee bit over-indulgent.